Here we are in mid-winter. The horses are fuzzy, muddy, and out standing in their fields … or maybe blanketed, bored and standing in heated stalls! However your horse is spending the winter, we can all dream of spring and riding season, coming up soon! Winter can be a challenge for even the healthiest horse. Constant damp conditions can cause a myriad of health issues, from rain rot to thrush to colic from not drinking enough water. Trying to stay ahead of all the potential problems can be a challenge to horse caretakers too. It is tempting to toss the hay and head back indoors, but for your horse’s sake, take a few minutes to do a quick health inspection. Run your hands over your horse’s rib cage and back — a thick fuzzy coat can hide weight loss, the beginnings of “rain rot,” and scurfy skin conditions, even ticks! Clean out hooves and treat any beginnings of thrush. 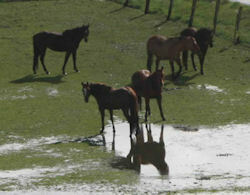 If at all possible, give your horse a dry place to stand so that hooves can dry out. Provide plenty of drinkable (not frozen or frigid) water and a salt/mineral block or loose salt in the feed. For older or compromised horses, increasing the amount of feed, especially a palatable, easily-digestible feed such at Purina Equine Senior, can make a world of difference. Shelter from winds and rain is also necessary to maintain your horse’s weight and health. Have questions about feed, or products that will make winter easier? Just come in to Rainbow Ag and ask one of our helpful staff members! Rainbow has everything you need – from thrush treatments to quality Purina Feeds – to make getting to springtime easier on you and your horse! If you are a fan of Podcasts, you won’t want to miss the new Purina Horse Nutrition Podcasts! This six-part series takes you through six stages of your horse’s life, with advice and tips from Purina nutritionists. Click here to find the podcasts – perfect for listening in the truck, while jogging or while mucking stalls! Winter storms are not just hard on our animals – they can be downright dangerous for all of us! Be prepared for power outages, floods, downed trees and blocked gutters with the right power equipment for the job. Get a dependable Honda Generator, and keep your power on even when it is off for everyone else! Honda pumps are perfect for drying out a basement or a barn. Rainbow has the full line of Honda generators and Honda water pumps, and we have experts on staff to help you select the best product for your use. Come in and talk to one of our Outdoor Power Equipment specialists to find the best solution for your situation. 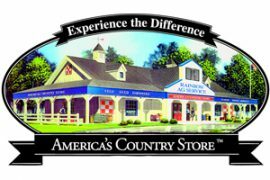 Spring IS coming … At Rainbow Ag, America’s Country Store, we know that because of the CHICKS! Arriving in the store soon (around February 1 in the Ukiah store, by February 15 at Lakeport), the chicks will be peeping and cheeping. Mark your calendars for the Poultry Party – March 8 at the Lakeport store, and March 9 in Ukiah – and save on all poultry and supplies, along with informational seminars each day to share just how easy it is to raise your own Backyard Flock! You have a Preferred Customer Card, right? 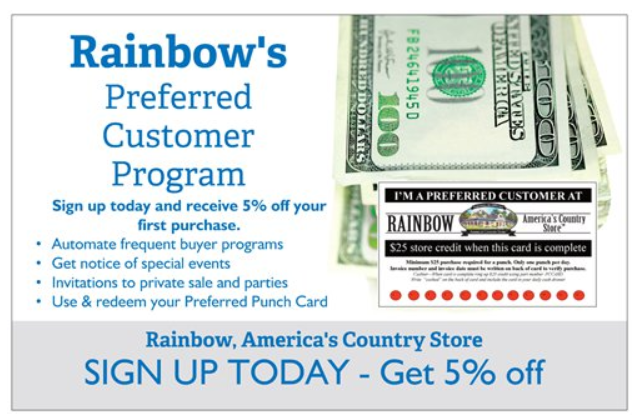 This valuable little card provides savings every time you shop at Rainbow Ag, and now there’s even more to like! Watch your email inbox to receive Preferred Customer specials, events and savings! It is like a double-dip into the savings department! Don’t have a Card? Just ask at the cashier counter, and we’ll fix you right up! Trivia – Win a $15.00 Rainbow Gift Card! All correct entries are entered in a random drawing. 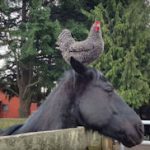 The January winner is Teri Crowhurst, with the correct answer that the Equine and Wine event held on January 19th featured local equestrian groups and businesses. This month’s question is, A horse’s fuzzy winter coat can hide … ENTER HERE! This entry was posted on Thursday, January 31st, 2019 at 3:03 pm	and is filed under News, On The Right Lead Newsletter. You can follow any responses to this entry through the RSS 2.0 feed. Both comments and pings are currently closed.